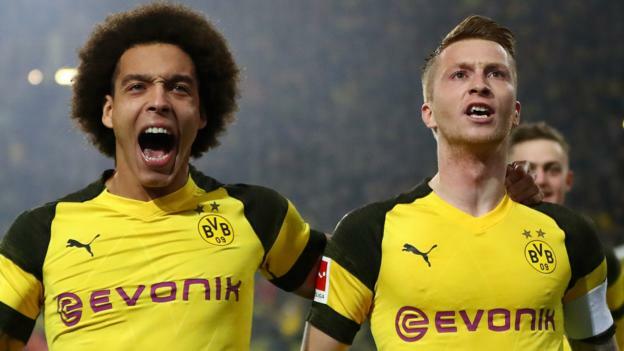 Leaders Borussia Dortmund twice came from behind to beat German champions Bayern Munich in a five-goal thriller. Robert Lewandowski broke the deadlock against his former club after heading home from the edge of the six-yard box. Dortmund levelled from the penalty spot through Marco Reus after he had been fouled by Bayern keeper Manuel Neuer. Lewandowski headed Bayern back into the lead before two goals in six second-half minutes by Reus and Paco Alcacer won it for Dortmund. Bayern, champions of Germany for the past six seasons, trail Dortmund by seven points in the Bundesliga table after 11 games.